your trip to the schloss. To assist you with your journey, consult the information below. You can travel to SCHLOSS Roxburghe very easily by car, train or plane, and we also have our own helicopter landing pad. It takes just over 1 hour to drive from Edinburgh and Newcastle airports. SCHLOSS Roxburghe is nearer than you might think. There is a selection of options if arriving from train. From London, regular trains travel direct to Berwick upon Tweed station, just over half an hour away from Schloss Roxburghe. 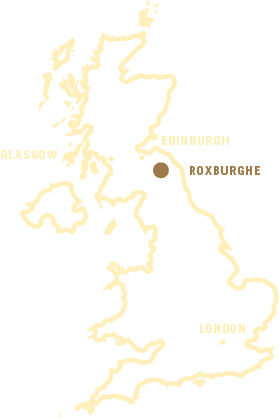 From Edinburgh, there are regular trains to Galashiels station, less than 20 minutes from Schloss Roxburghe. We would be happy to coordinate transportation for you to and from the stations via taxi. The nearest airports are Edinburgh (55 miles), Newcastle (45 miles) Glasgow (100 miles). It is also possible to arrive directly at SCHLOSS Roxburghe by helicopter. Coming from Edinburgh or Glasgow, exit the A720 (city bypass) at A68 signposted Jedburgh. Exit the A68 at Carfraemill on to the A697 and follow signs for Kelso. Exit the A607 on to the A6089 and follow signs for Kelso. Stay on the A6089 as it merges into the A698 in the town of Kelso. Here you should see signs for the Roxburghe Hotel & Golf Course. SCHLOSS Roxburghe is located on the right hand side just after the village of Heiton. Please enter the following data in your navigation system: ‘TD5 8JZ’ or ‘The Roxburghe Hotel & Golf Course’ in to Google maps.